ArtPalmBeach celebrates its 21st Edition at the Palm Beach County Convention Center from January 18-21, 2017 with a preview on the evening of January 17th. ArtPalmBeach is considered one of the most influential contemporary art fairs on Florida’s Gold Coast by both critics and art enthusiasts. International galleries from around the world will be exhibiting contemporary and emerging artists. The fair also offers a full schedule of lectures, art film screenings, artists discussions, and curatorial tours. Contemporary Art Projects USA/Gallery will present a curated exhibition by our chief curator, Mariavelia Savino during Art Palm Beach 2018. The Booth will be at the Prime Fair Location, Booth #302. Ricardo Cárdenas is a successful emerging artist born in México. His career is growing as his exhibitions and rising popularity demonstrate. Cardenas expresses his feelings and beliefs by connecting his Art, in media and technique, with his career as a construction engineer. To create his paintings and sculptures he uses building materials, concrete and steel bars, as his artistic media. Ricardo says: “My work reunites elements from my structural engineer profession merged with creative concepts inspired by the artistic movement “Arte Povera”. I narrate events of my life, express feelings and beliefs using building materials concrete and steel.” A genuine original creator, Cardenas always presents new unique proposals. In his Series of Tributes to Great Masters he reinterprets the main traits of the ART from a chosen Master, and uses as his canvas cement and iron bars characteristic of his work, on which he paints and adds collage, making the whole to look as a unique poster or street graffiti on a cement wall. The resulting Artwork has been greatly admired. At Art Boca 2017, Cardenas presented Mi Jungla: Tribute to Wilfredo Lam that sold during the Fair Opening event, followed daily, for the duration of the Fair, by further sales and commissions. Ricardo Cardenas brings his interpretations to our present time using the unforgettable imagery of an international master, but at the same time he making it his own. 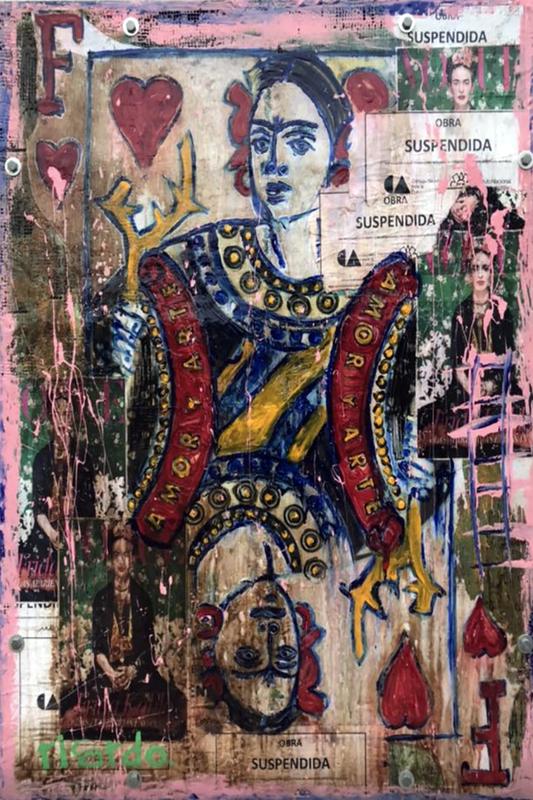 His impressive Artwork El Juego de las Fridas, presented by Contemporary Art Projects USA in RED DOT Art Fair 2017, was extensively celebrated by the media and sold the first day of the fair. In this extraordinary Artwork, he merged on a double tribute the ART of two Great Masters: Frida Kahlo (1907- 1954, Mexico) and Andy Warhol (1928-1987, USA), using paint and collage on a reminiscence of the popular Tic Tac Toe game depicting several images of Frida in the characteristic multicolored Warhol manner. Today, Ricardo recreated this experience making a tribute to the Mona Lisa by Leonardo Da Vinci. 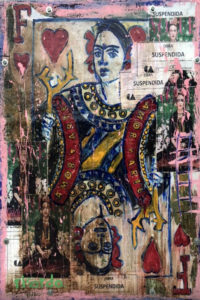 Cardenas participated presented by Contemporary Art Projects USA, at Art Concept and Art Santa Fe, NM, in 2016 and exhibited his solo show Paramo at Miami Dade College West Campus Art Gallery, Doral. In 2017, exhibited at Art Palm Beach, Art Boca and RED DOT, during Art Basel Miami week. Paul Christopher Conticelli/Italy/USA Paul Christopher Conticelli, a mixed media poetic artist based in New York City, personally and professionally developed his creative interests and talents through architecture, construction design, fashion and beauty. The most consistent path for his artistic expression is painting that he used in early life as a secret almost sacred form of healing. Drawn to Abstract Art, he pushed limits and discarded labels, reflecting his independence in his Art, believing that the power of Abstract Art is to be the great equalizer. A million viewers, each with a million stories, will see something different, each viewpoint valid as an act of self reflection and liberation. His paintings from a deeply personal place are also imbued with a universal sentiment. Developing poetry alongside his artwork allows Paul to combine two modalities of expression into one concise artistic thought. It is through his ever expanding vision of the creative process that he continues to cultivate a deep appreciation for the transformative properties of Art. He believes that through Art we can all learn about and love our true selves (extracts from the artist’s website). Paul says: “I write poetry that comes to me while I am painting. I share one verse of the poem with everyone and I give the complete poem to whomever purchases the piece so I keep it private between myself and the owner.” -” .. . I was not prepared to be vulnerable and show my artwork because I was a pedestrian hit by a drunk driver and in a coma for three weeks when I was 19 years old. I am one of three and my middle brother was unfortunately killed when I was 15 years old. Art and Poetry helped me significantly through these times of my life, as well as others, but it was too deep and personal that I was not ready to share my art or poetry with even my friends and most of my family until recently.”- “…I have painted privately for clients in the following places: Italy, Spain, Mexico, California, Hawaii, Several in NYC, Fort Myers, London, NJ.” Paul has exhibited worldwide and his works are in collections, such as Sojourn Selena Rosa; Vero on the Upper East Side NYC; represented by Vogelsang Gallery, Brussels; Cube Art Fair 2017, Brussels; Scope Miami 2017. Paul is exhibiting in Art Palm Beach represented by Contemporary Art Projects USA. Chris Delias lives in Vienna, Austria. 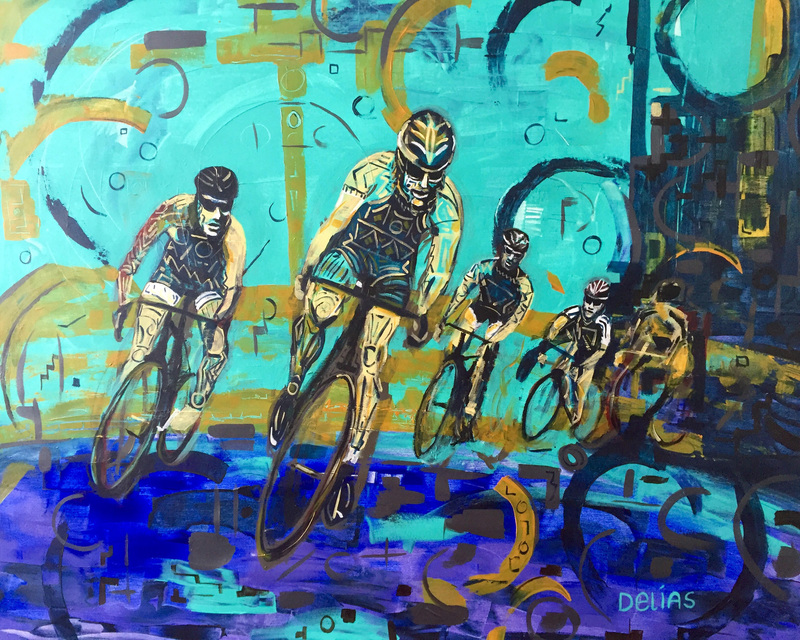 Following North European Expressionism, Delias translates the need of communicating trough meaningful Art created to portray everyday facts, fashions and people, with strong expressionism, colorful as well as natural. Fashions and attitudes developed into our society today, such as using digital cell-phones as cameras to take selfies to be posted in Social Media pages, sometimes including branding of the posers’ clothes or cars, just a simple logo or pattern that entitles the bearer to feel somewhat superior. The digital practice of working with symbols, reducing words or sentences, created the fashion of using ’emojis’ or ’emoticons’ that shortened our language to like, unlike, smiles, tears or hearts, expressing with one image what we feel or think on anything happening in our lives. It made to communicate universal for everybody, no matter what language they speak, going beyond location and the nature of the event portrayed. According how we judge it, a positive or negative phenomena. Delias says: “Social Media have digitalized our daily lives and the relationships between humans, making our lives public and predictable. Real friends, relations and feelings becoming less important. The problem, which I call “Anti-Real-Relationship, is superficiality.” Everything that makes our lives easier and faster will be successful, but it leaves a gap between the digital and the real. My art intends to close this gap, depicting emotions, humans, faces like you can’t find in our digitalized society. For me the spotlight is on the beauty of humanity, it’s my first priority: emotions caused by love, music, harmony… But, not only the sunny side of the world will be represented in my art – people don’t just love one another – they hate, fight, lose, feel intense pain, experience war and destruction, all part of human interaction… My work shouldn’t show reality 1:1 – the colors, proportions and poses I use, reflect my emotions and feelings during the painting process. It is an interactive process between my soul, the model or person/s and the canvas – an interactive realism. My art is a projection of the reality to my soul.” Represented by Contemporary Art Projects USA, Delias exhibited a Solo Show #CityLife at Miami Dade College West Campus Gallery, Doral; at Santa Fe Art Fair; and as part of the group show Variations on the same Subjects: People, Nature and Geometry in the Art Gallery at the ArtsPark of Hollywood, FL. Hugo Diaz, born in San Cristóbal, Táchira State, Venezuela, in 1965, lives in Miami, FL, since 2003. Graduated in Computer Systems Engineering at the Metropolitan University, Caracas, Venezuela, Diaz also went to Cristóbal Rojas Art School and to the Faculty of Architecture at the Central University of Venezuela, booth in Caracas. As an Artist, Hugo Diaz is an important member of the ‘new generation of Venezuelan Kinetic Art’. 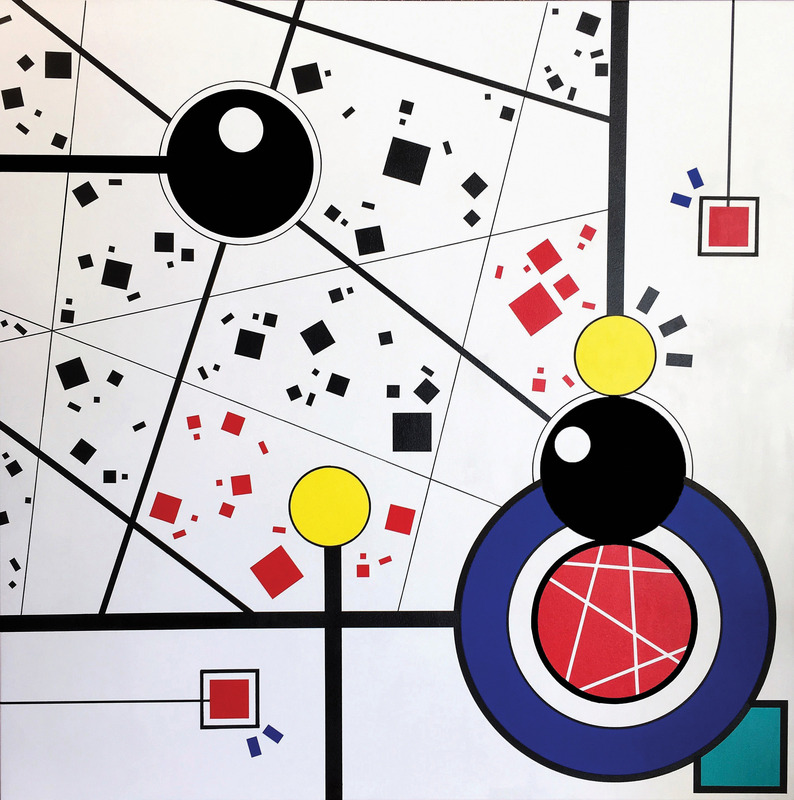 This Art genre is based on the aesthetic of the real and the virtual movement in the geometric abstraction. Diaz represents a three-dimensional reality on optical illusions by vibration and by watching contrasted surfaces brightly colored. Inspired by Kinetic Art international great masters, such as the Israeli Yaacov Agam, b. 1928, the French-Hungarian Victor Vasarely, b. 1906, d. 1997, and the Venezuelan Kinetic masters Jesús Rafael Soto, b. 1923, d. 2005, and Carlos Cruz-Diez, b. 1923, Diaz reaches his own new dimension creating an innovative reading for the Geometric Art genre. 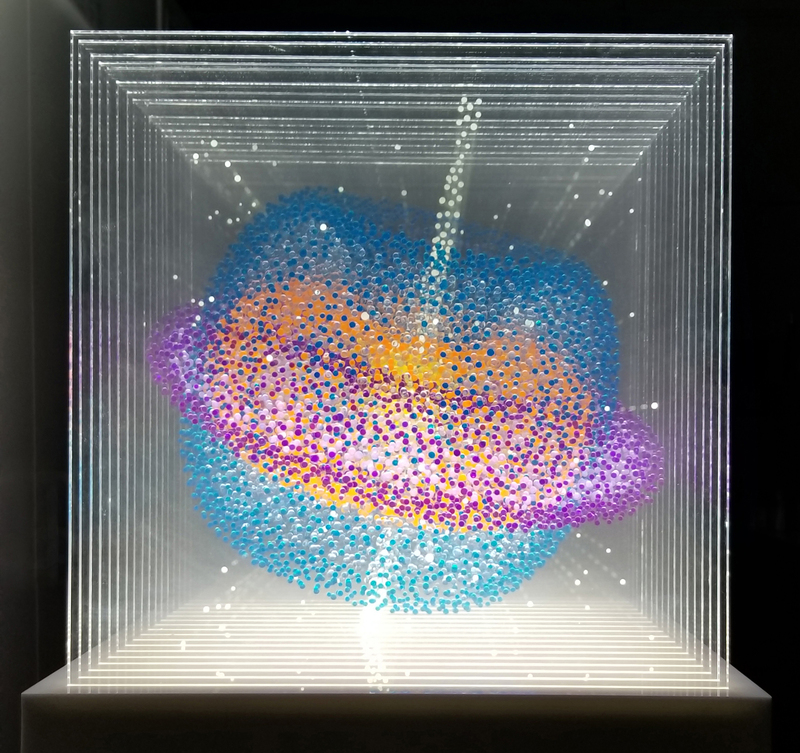 Created by the use of combined simple geometric forms in compositions on either virtual or real spaces, this Art goes beyond intuition and requires of an errorless rigorous method to achieve it. The creative proposal by Artist Hugo Diaz is conceived by emphasizing two diverse spatial dimensions in order to represent a three-dimensional reality. Pictorially, his work is based on optical illusions obtained by retinal vibration taking advantage of the impossibility for our eyes to watch simultaneously two contrasted surfaces that are intensely brightly colored. Throughout his career, Diaz has been constant in the search to create an unforgettable visual experience by developing his interest in color, light and vibration, integrating them to produce the impression of the energy in movement. Recently, Diaz exhibited his unique exquisite artworks represented by Contemporary Art Projects USA at Art Santa Fe 2017, NM; as part of the group show Variations on the same Subjects: People, Nature and Geometry in the Art Gallery at the ArtsPark of Hollywood, FL; and in RED DOT 2017, during Art Basel Miami Week. Kelly Fischer is a Switzerland-based/American born artists. Kelly always creates vibrant multicolored and powerful artworks. The artist says: “The colors that one chooses as an artist, are an unveiling of our creative personality. My intention is to provoke and present evocative artworks that leave an imprint on the soul… Color forces us to see things differently and does have an impact on the viewer… Shades of grey help to grasp and pay attention to line, shadow, and texture. But, the most significant feature is the strength in the piece itself… I developed a passion for painting and storytelling at young age… Over time painting challenged me in a way that nothing else ever had. I get a lot of satisfaction out of creating whatever I want…no rules or boundaries. Writing and painting are different yet the same. My dream is to reach a larger audience. The support received in both Europe and the States is influential in helping me to forge my career.” Kelly Fischer, a trained Montessori teacher, the founder and former Headmistress of The English Montessori School of Bern, Switzerland, is an Award-Winning Author with the book The Most Beautiful Color of All. Kelly Fischer is present in important national and international Art Collections. 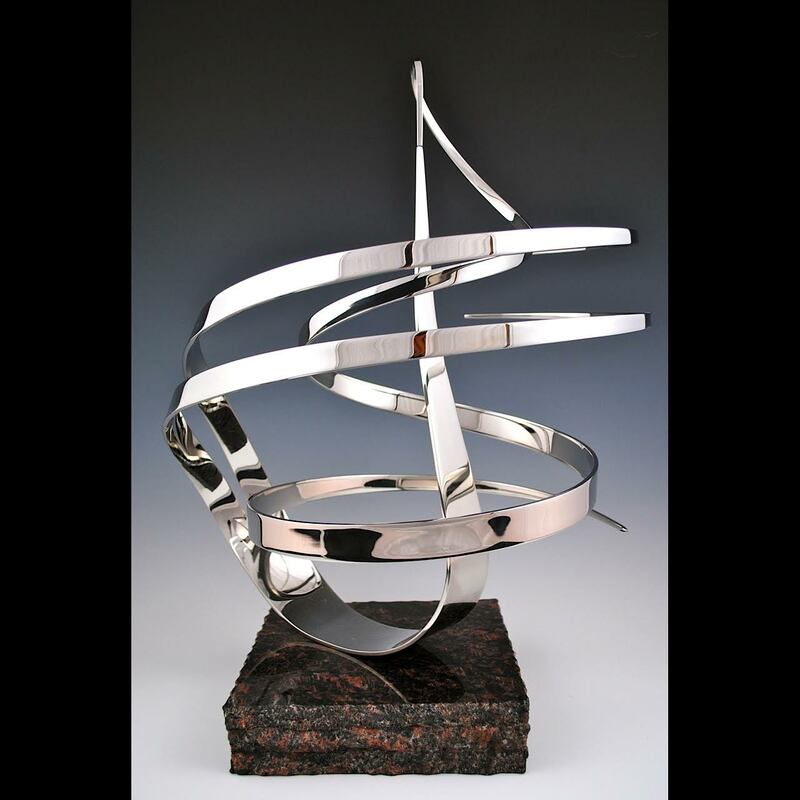 Recently, Kelly Fisher, represented by Contemporary Art Projects USA, had an outstanding presence in Art Concept 2016, and in 2017 at Art Palm Beach, Art Boca, as part of the group show Variations on the same Subjects: People, Nature and Geometry in the Art Gallery at the ArtsPark of Hollywood, FL and in Art Santa Fe, NM. Kelly Fisher also was exhibited by an European Fine Art Gallery at Scope Art Fair, during Art Basel Miami week 2017. Daniel Marin, a Spanish-German artist born in Wolfenbüttel, Germany, from Spanish parents, spent half of his life in Spain, where he currently lives and works in his creative career. 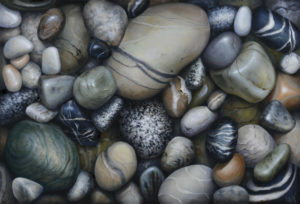 He started painting at sixteen and achieved degrees in English and Gemology in Spain. Marin worked as Graphic Designer in the advertisement industry and Jewel Designer for his own brand, increasing the foundation of his true passion: painting. Marin is interested in astrology, science, philosophy, religions and ancient civilizations. This rich knowledge is depicted on his works. He travelled the world, residing in Brazil, India and Morocco, visiting many other countries, where he always pursued to learn from their history, life’s approach and culture. His Artworks have been exhibited in relevant Art centers, in the cities of New York, Berlin, Stuttgart, Rome, Madrid, Barcelona, Salvador de Bahía, Paris, Venice, Dubai, Belgrade, or Nador, among others. After exploring different styles, techniques and figurative subjects, he decided to express his ideas and emotions through abstract painting that allows him to better communicate his complex inner world. Following the path of well-known Masters, American Jackson Pollock (1912–1956) and Cy Twombly (1928–2011), Dutch American Willem de Kooning (1904–1997), Armenian-American Arshile Gorky (1904–1948), or American of Russian Jewish descent Mark Rothko (1903–1970), Marin developed a personal style merging oil, acrylic, enamels, spray and collage techniques that have also parallels with the work of American Masters Robert Rauschenberg (1925–2008) and Jasper Johns (born 1930). His contact with varied cultures around the world, his own background and constant desire to learn, makes his Art unique. His first works were related to ancient gods and cultures, such as Greek mythology or Hindu religion. Searching for spirituality, Marin explored Biblical themes and recent alchemy, setting a practical and spiritual dimension. 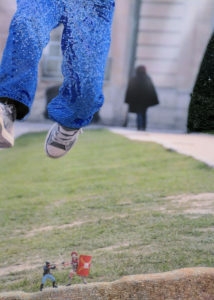 His goal is to transmit positive energy or feelings to benefit his viewers and our contemporary World. Daniel says: “A painter paints what he sees, an artist paints what he feels.” His artworks are part of important private and public collections in the USA and worldwide. In 2017, Marin exhibited at Art Boca represented by Contemporary Art Projects USA and, also sponsored by Kess Art, at RED DOT Art Fair, during Art Basel Miami Week, where he sold his extraordinary one of a kind painting Amor a Dios. 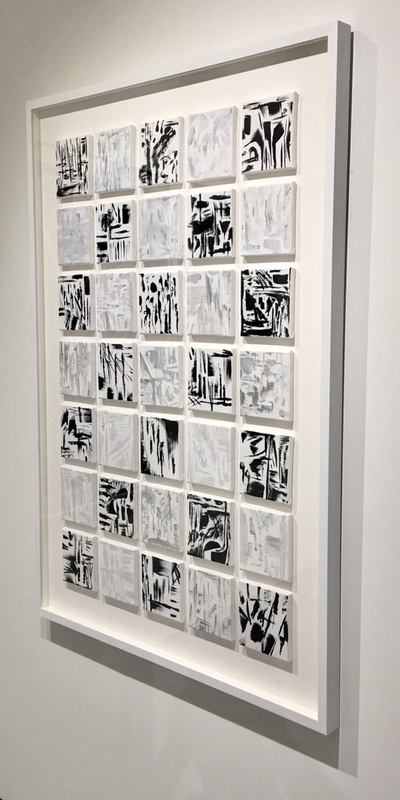 Tatiana Rajzman, a Brazilian Contemporary artist, painter and printmaker, has developed an important body of work in the field of Abstract Art. She also uses TRajz as her name d’Art and to sign her paintings. Tatiana, inspired by the colorful and impressive path traced by unique Brazilian Contemporary Master painters and architects, such as Tarcila do Amaral or Roberto Burle Marx, combines abstract and cubist elements in her Art, depicting colorful patterns and shapes to express her message to the viewers. In her paintings she frequently talks of her own experiences and feelings. Tatiana’s artistic background begun in the world of fashion design graduating from The Art Institute and continuing her career as a product developer for Perry Ellis International in Miami. Then, Tatiana has followed her artistic passion and inspiration through painting, with a great talent and skill, creating geometric compositions that impress and drive the viewer towards them. Her creation process is pristine and very well executed. Her clean lines and shapes almost dance on the canvas bringing happiness to the viewer. The sharp contrast between black and white and her precise colorful geometric shapes are distinctive of her work developed in acrylic on canvas and ink pen. After exhibiting as an emerging solo artist during Art Basel Miami week Art Fairs, Tatiana Rajzman will participate in Art Palm Beach 2018 represented by Contemporary Art Projects USA. Lara Restelli, Argentinean born, resides in Miami, FL, with her husband and two boys. From young age, Art is in her life. Following a Bachelor degree in International Business, a successful career in Buenos Aires, Argentina, brought her to the US. Here, Lara studied with renowned artists Eva Roffe and Alberto Pancorbo, who introduced her to oil painting classic realism. Confirming her skills and natural talent, she exhibits in Restelli Art Studio, Miami; Winner of BJ Spoke Gallery N.Y. fine arts competition; Artrageous Gallery, Coral Gables; Flor500.com a Xavier Cortada’s Project, FL; Dot 51, Miami; and at the Schacknow Museum of Fine Arts, Plantation, FL. Her Art is in private Collections, some at prestigious Miami condominiums entrance lobbies: Aria on the Bay, Flagler on the River, Ski view, Oak Plaza, 25 Biscayne Park, and One Plaza. 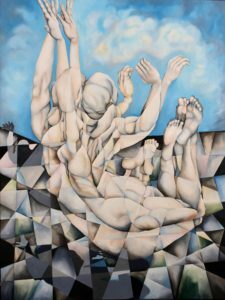 Lara says: “Inspired and influenced by Great Masters and Modern Artists, I create my vision of the world through paintings. Each paint layer evolves from simple lines to detailed scenarios. True to the essence of oil painting, I add a modern concept for the contemporary viewer to relate with. High contrasts and strong emotions are denominators in my work, expressing passion, seduction, affection, strength, grace, loneliness or sadness. Through my Art, I create a dialog that viewers can complete… Art became a passion when my boys were born, nourishing my soul, filling my life, teaching me to observe and capture beauty in everyday objects and situations. Nature is my mentor and inspiration. I explore the story behind objects conveying my feelings through my own representation of nature. My painting process is an evolution of basic masses of tones to delicate details of thin oil paint. I find excitement, happiness and peace, feeling accomplished when I transmit my thoughts and emotions to a canvas. The process is complete when I share with others, reaching and connecting with those that have my same respect for life’s simple things. Then, my journey is complete.” In Restelli’s Art is remarkable her positive inspiration depicting the beauty of nature and humanity, making her works uplifting and inspiring. Her realistic Art mastership in oil painting with skillful technique, outstand and impress. Her unique original Modern Contemporary Artworks, full of feelings, color and composition, delight connecting with the viewer. Lara was represented by Contemporary Art Projects USA at RED DOT 2017, during Art Basel Miami Week. Anrika Rupp born in New York, lives in Miami and Caracas, Venezuela. A Columbia University School of Engineering, Bachelor of Science, she also studied Communications Design at Parsons School of Design, New York, NY. 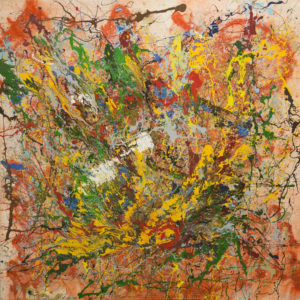 Widely exhibited at European or American Art fairs, galleries and institutions, her Art is in elevant collections worldwide. A main goal for Anrika is to merge Art with Science. She says: “I stand before nature asking: Why?… I observe and look for patterns, symmetry, a tendency product of our evolution. With their resolution range, our eyes see certain sizes. Developing tools to see what is larger or smaller, we observe patterns and repetitions within scales emulating other scales. Few simple rules create all that we see in nature’s design, efficiency and scalability. Atoms interact without divulging the secret of what we call life and why certain combinations result in a living being and others a rock… A small variation can lead to an entirely different result. But, it is always coherent and harmonious, often aesthetically beautiful.” Regarding her successful Series Galaxy in a Box Anrika says: “In my studies spheres arise persistently. Viruses are spherical as planets, moons and most celestial bodies. My latest series of spherical objects is inspired in the space wanderers documented by the Hubble Space telescope. Those impressive orbs floating in the vastness of space, some cold and quiet, others a furnace of atomic fusion, all together give me awe, longing and infinite loneliness. The pull they exert on my imagination fuels my drive to search for understanding, inspiring me to find the origin of the sense of identity that the vastness of outer space and the atomic world create in me.” Anrika Rupp, represented by Contemporary Art Projects USA, had an outstanding presence in Art Concept 2016, and in 2017, at Art Santa Fe, NM, as part of the group show Variations on the same Subjects: People, Nature and Geometry in the Art Gallery at the ArtsPark of Hollywood, FL and at RED DOT Art Fair during Art Basel Miami week. Anrika Rupp solo show From Earth to Infinity presented in collaboration with Contemporary Art Projects USA at Miami Dade College West Campus Art Gallery, Doral, will open from January25 to April 12, 2018. Nataly Schloser, a Venezuelan artist based in Miami, FL, is a graduated Lawyer and a very promising unique Visual Artist. Her artistic career began when she experimented with mosaics to create unique pieces of furniture, covering dining table tops, bars, walls, screens and headboards. She has collaborated with numerous architects and designers, as well as worked freelance in Panama, Venezuela and USA. Recently, Nataly explored the art of photography, merging it with her passion for mosaics. She calls this technique: Intervened Photography. By applying this artistry, she achieves an unmatched perspective of texture, shine and color to her work, creating one-of-a-kind pieces. 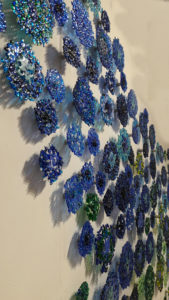 We can say that the unique and exquisite artworks by Nataly Schloser are a never seen before fusion among two of the most important media in the history of the Visual Arts: Photography and Mosaics. Photography, from the Greek phōtos ‘light’ and graphé ‘drawing’, means ‘drawing with light’. In the 20th century, became an main Art genre with styles and techniques in constant evolution. Mosaics assembling small pieces of glass or other materials flourished in Mesopotamia, Greece, Rome, the Byzantine Empire, the Middle East and the Renaissance. Architect Antoni Gaudí used modern Art mosaics at Park Güell, Barcelona, Spain. In 2017, Nataly Schloser was commissioned to create the Donor Wall, 12 x 12 feet, at Scheck Hillel School, Aventura, FL, and the Aaron Hakodesh, 12 panels representing the 12 tribes, for a Synagogue in Panama. In 2016, she created the Donor Wall, 12 x 8,11 feet, for the Synagogue Lubabich South of Aventura, FL. Two Artworks by Schloser are today part of the Canpro Collection at One Park Building, Boca Raton, FL. 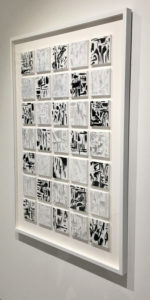 In 2017, Nataly Schloser exhibited her unique Artworks, represented by Contemporary Art Projects USA, at Art Santa Fe, NM, as part of the group show Variations on the same Subjects: People, Nature and Geometry in the Art Gallery at the ArtsPark of Hollywood, FL, and in RED DOT Art Fair, during Art Basel Miami Week. Merrill Steiger lives and work in NYC and Woodstock. Steiger’s Art reflects her travels, spiritual practice and collage composition. She developed color fragmentation juxtaposing strong colors and hard-edged shapes. Back from Mexico, Merrill painted abstract architectural images relating the art of an ancient culture into her own art, also visited spiritual Power Spots charged with positive energy, contacting the art of Aboriginal Australians, indigenous Africa or Asia traditions in Cambodia, Vietnam, India, the Himalayas and Japan, making collages influenced by origami and Japanese colors. Influenced by bodybuilding, she painted abstracted nudes. Meditation inspired the series Zen Dot Energy reflecting India’s circles and chakras. Her series Unseen Universes of organic forms, had landscape imagery with changes of scale from microscopic to cosmic a journey through the inner space of one’s own consciousness. Worlds Collide, incorporated anthropological references to previous series, petroglyphs, Zen rock gardens, Buddha statues and mandalas. Dreamland, had references of Cappadocia and Turkey. GNH, Gross National Happiness, inspired by countries solemn and/or spiritual in nature, reflected the peace and joy of spiritual self-exploration. 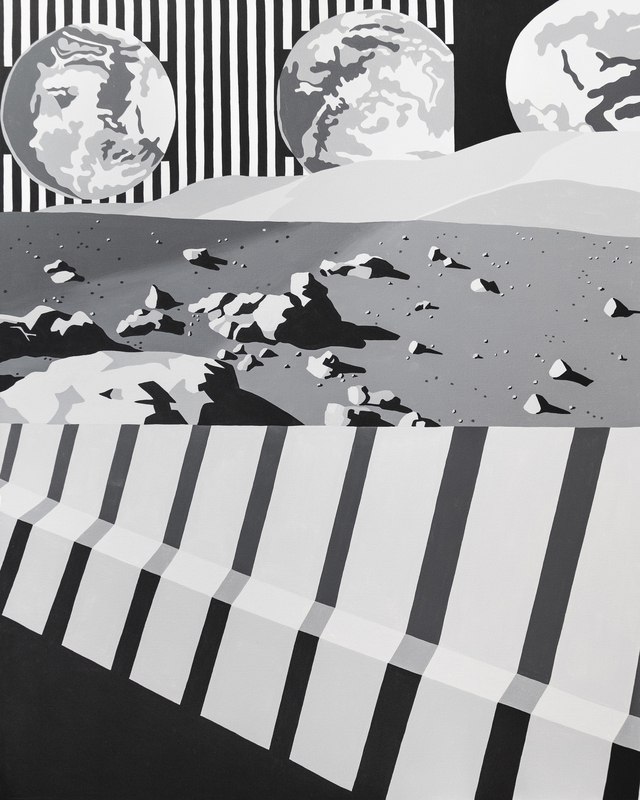 Her 2016 series Sci-Fi, has a monochromatic study of light, shadow and space, depicting a large fantastical imagery merging pioneering space traveling with early black and white photography. 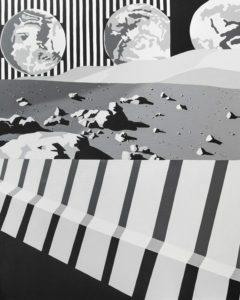 Her images are inspired in the first human views of outer space from the surface of the moon. She exhibited at Pennsylvania College of Technology, Williamsport, PA; Missouri Southern State University, Joplin, MO; La Guardia Community College, Queens; Connecticut University, Stamford, CT; University of Michigan, Ann Arbor, MI and Utica College, Utica, NY, and at museums, art fairs, galleries, public or private collections: BDNY, NY, NY; Allegany Arts Council, Cumberland, MD; Tubac Center of the Arts, 19, AZ; Saatchi Art’s The Other Art Fair Brooklyn, NY; Hoyt Regional Juried Art Exhibition, Certificate of Excellence Merit Award, New Castle, PA; SHIM, Invitational 3, Brooklyn, NY; Florida State University Museum of Fine arts, Annual Tallahassee International Juried Competition, Tallahassee, FL; Brooklyn Waterfront Artists Coalition, Brooklyn, NY; Metro Montage XV, Marietta/Cobb Museum of Art, Marietta, GA; SIPMA Contemporary, Goggleworks Center for the Arts, Reading, PA; Cosmos: Imagining the Universe, Annmarie Sculpture Garden & Arts Center, Dowell, MD; Gallery Gala 17, Arnot Art Museum, Elmira, NY. Merrill Steiger was represented by Contemporary Art Projects USA at RED DOT 2017, during Art Basel Miami Week. Gary Traczyk lives and work in Miami, FL. Attended Miami New World School of the Arts and an international art program in Italy, where he resided during childhood. 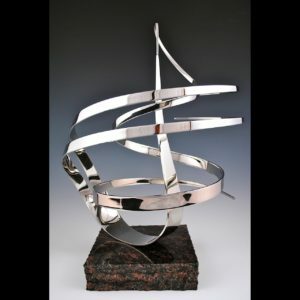 Traczyk said: “Growing up there, studying Renaissance Art and drawing in charcoal, had enormous influence on me.” Gary creates unique, lively, mirror polished stainless steel sculptures with curved balanced arabesque shapes interacting with viewers, almost dancing with them. His creative process takes eight to twelve weeks: “There are no molds, each sculpture has its own personality. I use marine grade stainless steel cut on a band saw, grinded to smooth edges, sanded, buff it out with rouge, form around organic objects and jigs I previously created. Reaches a form I like, I sand and polish to mirror finish. I use geometric forms in space creating movement of light and reflections of the surrounding area. They are kinetic and move several minutes with one touch. The pivoting point is a stainless steel bearing.” Gary worked with the National Foundation for Advancement of the Arts and Miami Children’s Museum. Published in Celebrated Living Magazine American Airlines 2015; ArtBlend Magazine Featured Artist 2015-2016; Art Daily News International; Castle Rock Entertainment A Mighty Wind; Miami Herald; Miami Herald Neighbors; NBC I Am Miami Campaign; NBC Featured Artist Miami Coconut Grove; Southwest Art Magazine; Palm Beach Florida Weekly; Malibu Times; Crafts Business Magazine; The Desert Sun; Bottom Line Magazine; HGTV. 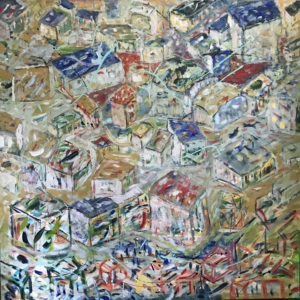 The artist has participated in Art Fairs including SOFA Chicago, Art Palm Beach, Art San Diego, Toronto Art Expo, and Spectrum Miami. Recently, Gary Traczyk was represented by Contemporary Art Projects USA, and had an outstanding presence in Art Concept 2016, Art Palm Beach, Art Boca, and RED DOT Art Fair 2017, during Art Basel Miami week. Michele A. Utley-Voigt from California, lives and work between CT and NYC. She studied at The Otis Art Institute of Parsons School of Design, Los Angeles, CA; Parsons School of Design, Paris, France; Bachelor in Pre Law/Political Science, California State University, Los Angeles, CA and Women’s History at Glendale College. She says: ” I worked in oils since early life… The cause for which I create is my acute foresight and sense of the interconnectedness of all elements of all time. The dialogue I consign includes all elements past and present, their atmosphere and their energy collective interacting with one another. I paint to deliver a vision that others have not seen, what is seen and unseen, beauty after tragedy, existence pictorially fragmented, as the energy and emotion around each being. I engage, evolve and cultivate these works until the moment does arise that I produce them. I recognize the progression in color, form, material, and shape… Current events are capable of influencing and altering the works. Present affairs impact the images but frequently their purpose is so interwoven with the past that they often forecast occurrences before they transpire. My works and their implications are everlasting. I paint stories of the human experience. The soul of life depicted in figures interacting within a realm of time. I carry and grow images from inside myself, until I create.” L’ ame de la femme enters complex layers of female beauty to examine, embrace and extract women’s inner magnificence. She Defies Gravity is a woman soaring, rising, flying, frolicking and ascending at any stage or event in her life. Every Child My Own is the respect with which a child must be treated, a call to stop bullying, harassing, molestation or cruelty to children. The Art, round as our World, is a call to goodness, kindness and beauty, to exalt the real best side of human nature. She has widely exhibited and obtained awards. Michele exquisite and unique paintings were presented by Contemporary Art Projects USA at Art Palm Beach, Art Boca, Art Santa Fe, as part of the group show Variations on the same Subjects: People, Nature and Geometry in the Art Gallery at the ArtsPark of Hollywood, FL, and in RED DOT 2017, during Art Basel Miami Week.